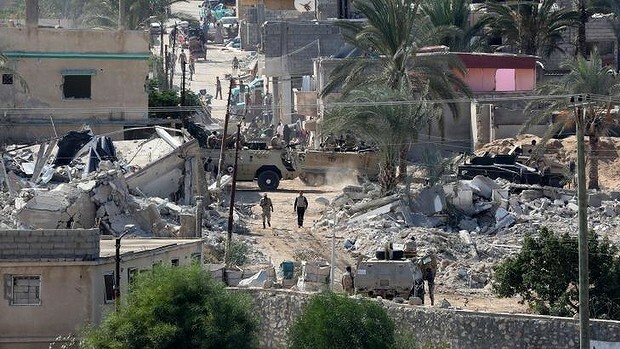 Channel 4 reports: “As Israeli police moved in heavy numbers into the Silwan neighbourhood of Jerusalem adjacent to the old city, the Egyptian army’s demolition of buildings in Rafah, in northern Sinai, continued……..
World View: Compromise is no longer feasible, and the army controls the levers of power. But can its victory be conclusive? All parties in Egypt have overplayed their hands in the two and a half years since the fall of Hosni Mubarak in 2011. In the first months it was the army high command deceiving itself into believing it could marginalise those demanding radical democratic change. Then it was President Mohamed Morsi and the Muslim Brotherhood interpreting a narrow electoral victory as a mandate to rule alone. With the overthrow of Morsi by the army on 3 July and the massacre of Muslim Brotherhood followers on 14 August, the Egyptian army is gambling that it can win an outright victory and crush the Brotherhood, eliminating it permanently from Egyptian political life. The attacks against the masses who gathered on the squares in Egypt in defiance of the military coup have turned into a massacre. Hundreds of people who took to the squares against the fascist military coup are killed, thousands are injured during the attack. And while these brutal attacks continue with all its barbarism, state of emergency was declared in many cities in Egypt. As the deepening contradictions in Egypt are not being resolved, they have put the country in a more complex situation. As is known, the people of Egypt now more impoverishing and suffering from more repression have toppled the Hosni Mubarak regime with the rebellion started two years ago. However the spontaneous peoples uprising lacked revolutionary leadership and the Egyptian army attempting to control the uprising, supervised the elections and the Muhammed Mursi administration came to power. As it is its nature, also this administration in its core continued the rule of the previous administration. Upon this the masses have risen again. Following this uprising the army was once more activated to prevent the growing popular opposition to flow into a revolutionary stream. With this aim, the coup on behalf of the Supreme Military Council was committed and the leadership was seized. Muhammed Mursi was arrested on 3rd July. As a result the narrow minded organization Muslim Brotherhood have lead the masses within their influence spheres to demonstrations. The backward segments in the government will use doctrines based on religion and nationalism on the poor layers of the people for their own gain. In fact, this is what the Muslim Brotherhood Movement (Muslim Brotherhood) is doing. WASHINGTON — U.S. President Barack Obama expressed deep concern about the Egyptian military’s removal of President Mohamed Mursi on Wednesday but stopped short of condemning a move that could lead to a cut-off in U.S. aid. Obama issued a written statement responding to dramatic events in Cairo after huddling with his top national security advisers at the White House. The session took place shortly after the Egyptian military made its move.